DJ laptop stands are vital to every DJ, musicians, or even music producers. It serves as their “table” to put their tablets or laptops securely. Given its importance, the quality and not just the appearance of the DJ stand is essential. This will affect the way they manipulate the sounds and songs and therefore change their performance. Considering the number of DJ stands available in the market, choosing the right one for your preferences and needs can be tough. For this reason, the list below enumerates the best finds in DJ stands in the market. This list also aims to provide information on its different features which you might find interesting or useful. The UDG U6010BL offers durability with its high-quality construction and composition. It is made out of high-quality aircraft grade anodized aluminum, a very tough material. Also, you can guarantee the security of your gadgets while using this equipment. Aside from durability and safety of the device, you can also enjoy this DJ equipment’s portability. You can compose or edit your music without sacrificing the space you occupy. In addition to these features, its length can be adjusted for different purposes. You can change its height and its angle, while you can also rotate the tray itself. If vision or angle is your device is your concern, this feature will be hugely helpful for you. On top of all these features, this DJ tool also protects your device from overheating through its airflow constructed tray. It also has one removable sub-tray where you can put other tiny materials such as earphones and the like. The tray of this DJ tool can hold laptops whose sizes range from 13 inches to 18 inches. The Pyle Portable Folding Laptop Stand offers Flexibility, security, and sturdiness. Its versatility is made possible through its adjustable height. This little table can be adjusted from 12.6 inches to 16.7 inches. Also, you can manipulate the tray’s angle through its rotatable feature. You can also bring and use this item anytime and anywhere. This was made possible by its easy to disassemble function. Purchased as an assembled item, it can be dismantled without much hassle and returned to its assembled form. This makes the product ideal for on-the-go kind of activities, where only a small space can be used. Security of your device, on another hand, is made possible by this equipment’s anti-slip foldable design. Its legs have an anti-slip feature and are snuggly assembled to keep accidental slides and falls at bay. Also, this item is made of heavy-duty materials which make the entire item sturdy. The shelf allotted for the device can accommodate any with dimensions measuring 8.6 inches by 9 inches. Ultimate Support Hyperstation serves well for those who are always on-the-go. Its structure allows you to fold it down to store it easily. Upon purchasing this item, you are also entitled to a T-stand which you can use on table tops. The most distinguishing feature of this product, the QuickRelease center post, offers convenience. It gives you a position where you can mount to and from HyperStation QR along with a 5/8″ threaded post, which you can use for a mic stand, mic boom, and the like. As for matters of the durability of the component items, you have die-cast aluminum for its primary material. This makes it a solid material to withhold even heavy-weight devices. With this DJ equipment, you can also adjust the support arms which secure the device in its place. The Magma Control Stand provides to carry both a DJ-controller and an electronic device at the same time. This feature makes it ideal for club and even studio installation. With its petite size and space-saving characteristic, DJs can even use this apparatus at home. This item can also accommodate a wide array of devices. Its height and width can be adjusted according to the needs or demands of the user. You can easily manipulate the stand platforms with the help of this feature. As for its components, it has a slip-resistant rubber surface as well as in its base legs. This secures the DJ apparatus itself in place to avoid the device from being too wobbly. With these features, DJs are given aid regarding the space they occupy. These features alleviate the area occupied by most DJs. Also, it helps DJs organize their workspace, as it offers them convenient spaces to put their controller and some cords. Hercules DG400BB has a simple and minimalistic appearance. It comes in one simple and assembled piece which offers an easy-to-use and easy-to-manipulate mechanism. With its build, there are no parts that are loose that may cause problems later on. It has an upper part where the electronic device can be placed, which is completely adjustable. This allows DJs to manipulate the angle of the device for different purposes—which can be for better vision and such. Aside from the angle, you can also adjust the height of this item, according to how you want it or how circumstances demand it. As for its support, it has one thick, ladder-like structure that leads down to two front and two rear legs. These two provide study support for the device, particularly the rear leg which has a robust design and component. Upon purchasing this DJ equipment, a laptop bag and laptop stand are also included in the package. Crane Stand Centerstage provides security and ease for DJs with its minimalist yet convenient design. It stands boarded by four sturdy black rods, which support three black metal holders arranged by layer and size. Aside from offering a DJ stand to hold devices like laptops and tablets, it also provides a place for a DJ control panel and even a portable projector. In fact, DJs can have all of the items placed in this singular DJ stand. Despite having too many things put, the materials itself make it sturdy enough to hold them all without breaking or having signs of it. While it helps DJs save space, it also helps them adjust the electronic device to be used. Its flexible feature allows adjustments for the electronic device to be viewed at an angle where it can be seen. Also, its weight and height make this item easy to bring and easy to use anytime, anywhere. The Crane Stand Plus Universal DJ Stand features a powder-coated steel frame that enhances its durability, while it stands readily assembled. Its knob and lever are all made out of aluminum, which is also a sturdy material. The stand of this DJ apparatus is highly adjustable, allowing proper eye-level height and angle for the user. Adjusting the levers are made easy with the help of the cam locking bars and tensioning knob mechanism. This makes the laptop-holding board easy to change so that it can be leveled accordingly. Aside from the angle, you can also manipulate its configuration—either Z configuration of the C configuration. Each of these set-ups will work well in any environment but has particular advantages. The Z set-up can opt for better stability while the C set-up can be used for better height. The weight of this product makes it easy to bring it anywhere and use it anywhere as well. You can work even at the comforts of your home with this material without occupying too much space to work on. This DJ stand comes with a nylon carry bag for better storage and transportation. The Odyssey LSTANDM DJ Stand presents itself in a box-like structure that offers stable support for electronic devices DJs use. While supporting an electronic device, this tool can also help other devices at the same time. These devices include a CD player, a controller, a sound machine, and the like. Presented with a sleek and minimalist design, the Odyssey LSTANDM DJ stand adds up a simple yet pleasing element to your workplace. This tool comes with stand-alone legs (which make up the box-like structure). Having this characteristic, you can use this stand on top of tables and not occupy too much-working space. To secure the equipment itself, the package also comes with clamps. These clamps will function as a connection of the stand to the edge of the table when attached. While this tool may have a sturdy structure, it still comes in a very lightweight and therefore, portable. The package also includes a storage pouch. Can hold many devices and equipment in one. Clip locks can be a problem in securing sturdiness. CedarsLink Heavy Duty Studio controller provides a classy, sleek and useful set-up for DJs. You can find this helpful product regardless of the brand or unit of your working laptop or device, as this can accommodate various units. Units that this equipment can handle include iPads, Pioneer laptops, Denon Laptops and Vestax laptops. In addition to that, you can also adjust the width and height of this item. The smallest adjustment you can make measures 10 inches by 9 inches by 25 inches. You can change the angle of your device placed depending on however you want it to. Its setup makes it practical for DJs. It has a slot for the electronic device and just a few inches below it is a support for the other device. This pertains to a DJ’s control panel, sound mixing device and the like. To secure the device and the stand itself, it comes with a non-slip rubber surface and legs. Magma MGA75527 Vektor comes in durable metal construction, allowing it to withstand heavy weight and pressure. It can support both an electronic device and a DJ controller pad all at the same time. On top of offering durability through the component, this item also provides security through the slip guard rubber. These rubber portions make sure that the devices don’t slip out of the stand. As for its structure, users can quickly assemble and disassemble this equipment. The procedure was made possible by the stable quick-release clamp mechanism. Users can manipulate the height of this DJ tool, according to how they find inconvenient to use. Measurements of adjustment for the height range from 14 inches up to 22 inches. Aside from the height and width, you can also rotate the laptop table tray in 360 degrees for better views and usage. Upon purchasing this DJ laptop stand, you also avail a transportation pouch and another set of colored non-slip rubber rings. 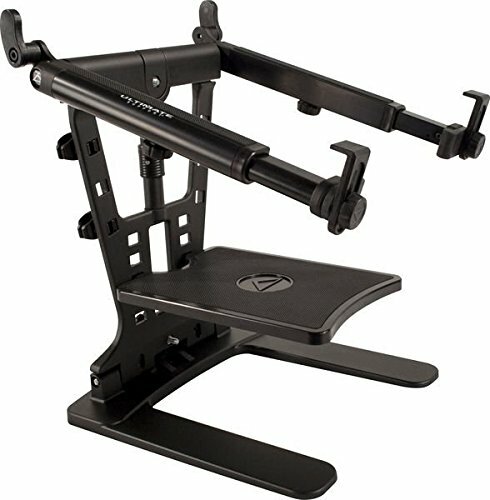 Below is a list of the best DJ laptop stands but before you take a look, it is crucial to first equip yourself with knowledge of choosing the best model that will suit your needs. 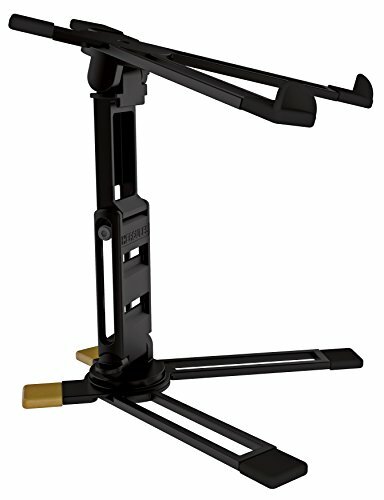 Here is a buying guide along with a list of the top-selling DJ laptop stands that every music producer should know about. 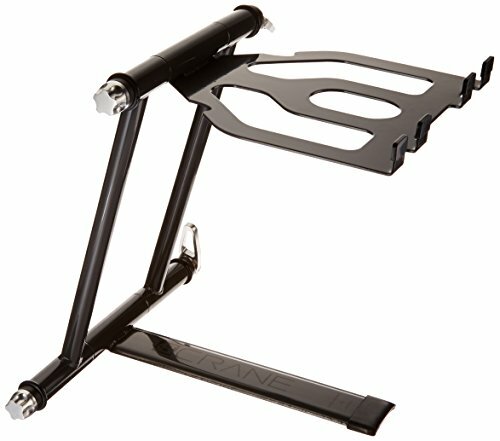 What is a DJ Laptop Stand? A DJ laptop stand is vital in securing your laptop while performing. 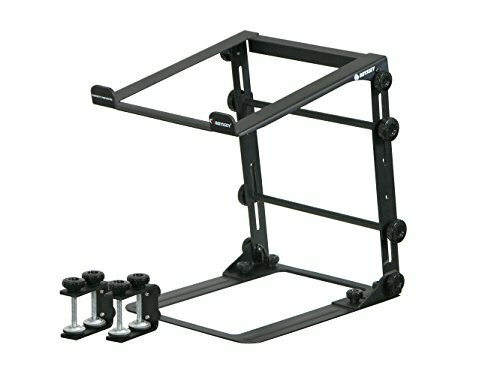 These stands are built to provide maximum security and protection to your computer in a busy environment. Aside from that, it makes it easier to reach for the laptop when doing your work. 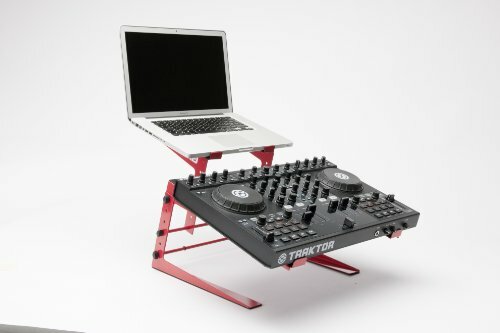 DJ laptop stands may seem like a luxury item, but it is actually a must-have for every aspiring DJ and music producers. The first thing that you should consider is the durability of the stand. It must be durable to secure your laptop. When buying DJ laptop stands, opt for a model with a clamped design. Due to the loud music, it will most likely create vibrations that might threaten your laptop. Having a laptop stand with a robust foundation can help you secure your laptop when you’re working with your music. This is in the concern of the stand’s durability. 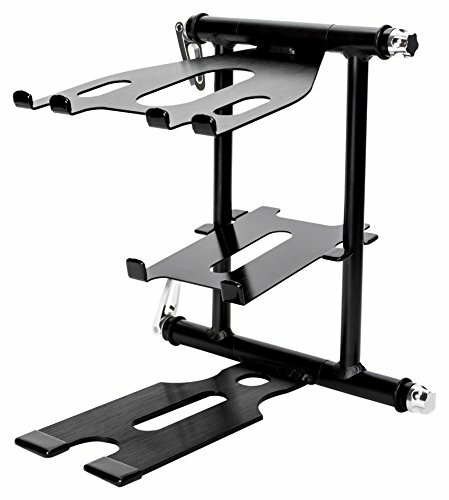 Some stands are made of anodized aluminum and other heavy-duty metal materials. It will help you to ensure that your laptop is secure when you place it on the stand. Some laptops can be a tad heavy at 13 inches, so you might want to buy a DJ laptop stand that can accommodate all the weight and secure the gadget. As a DJ, you jump from one party to another. 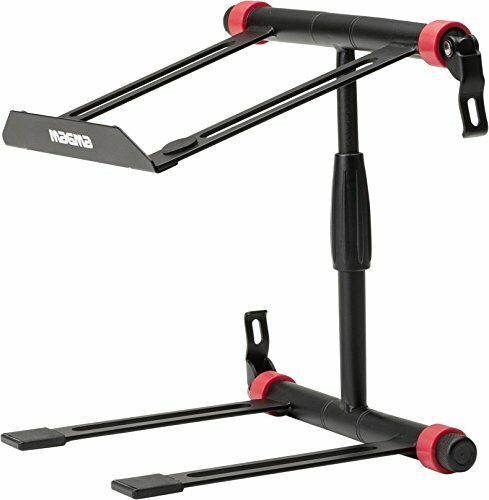 It is wise to buy a DJ laptop stand that is durable and easy to carry. A heavy laptop stand, albeit more stable, will only cause hassles in the long run especially if you travel a lot as a DJ. Some stands even feature a handle to make it easier to carry anywhere you want. You might want to invest in a laptop stand produced by a reputable manufacturer. Always read the reviews of other customers to know what to expect from your stand when it arrives. 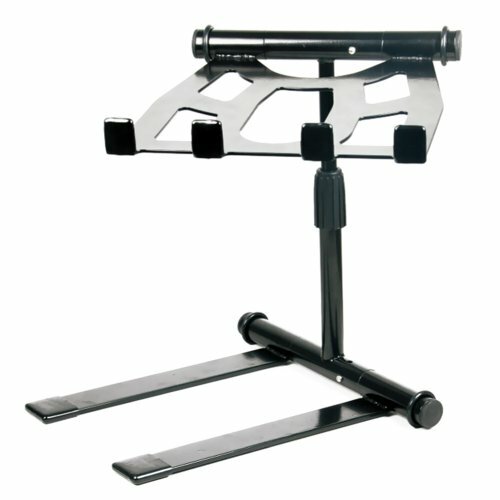 Buying a DJ laptop stand from a trusted company will assure you that your laptop stand can last for years to come. One of the practical features a laptop stand must have is the protection from overheating. Since you’re going to use your laptop the entire night, it is best to ensure that it does not easily overheat. An overheated laptop may cause irreparable damage in the future. You might want to protect your device from overheating with an elevated laptop stand that will not cause such a problem to your device. Another useful feature that you might want to consider is a tray where you can store small items such as earphones, pens, phones, and the like. Some DJ laptop stands come with a tray for that very purpose. It can be useful to keep the valuable things close to you as you work. It also keeps your workspace organized. 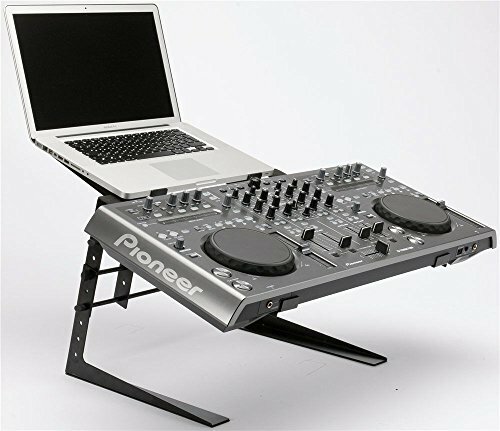 Your DJ laptop stand must be adjustable. It means you should be able to put it anywhere. The location of the DJ will vary. Choose a stand that can be easily adjusted and rotated according to what your environment will allow you to. In that way, you’ll be able to set up easily and with no hassle at all. 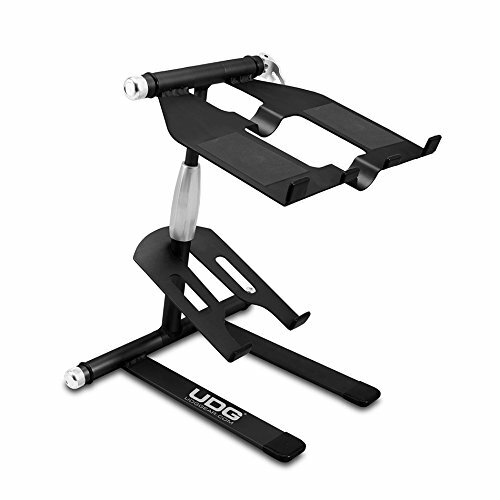 Lastly, choose a laptop stand that has a universal fit. Some DJ laptop stands are designed to fit 13 to 18 inches of a laptop. It will also depend on the size of your laptop, but it’s wise to buy a stand that can accommodate all sizes. You never know when you’ll change your DJ laptop in the long run.